DOMESDAY (AUS) (Brown 2002-Stud 2006). 2 wins at 2, STC Silver Slipper S., Gr.2. Sire of 500 rnrs, 298 wnrs, 18 SW, inc. Daysee Doom (ATC Coolmore Classic, Gr.1), Pressday, Extra Brut, Ruthven, Doctor Doom, Oregon's Day, Arcadia Dream, Domesky, Five to Midnight, Heart Starter, Antelucan, Divorces, Royal Symphony, Have Another Glass, Italy, Cailin Miss, Sunset Rock, Backgammon, SP Supara, Whatalovelyday, Giresun, Nextanix, Grim Reaper, etc. Rillito (f. by Street Cry). 5 wins to 1200m, A$215,450, to 2017-18, ATC TAB Rewards H., MRC Keno Heads Tails Margins H., Elaren Security Services H., MVRC McMahon's Dairy H., 2d MRC Ladbrokes Odds Boost Exotics H., MVRC Epi Cafe H.
Cordoned (g. by Lonhro). 3 wins at 1000m, 1100m, A$84,340, in 2017-18, ATC Schweppes H.
Straight (c. by Lonhro). 2 wins at 1400m, A$79,775, BRC Brisbane Town P. Sire. Dogmatic (g. by Domesday). Winner. See below. 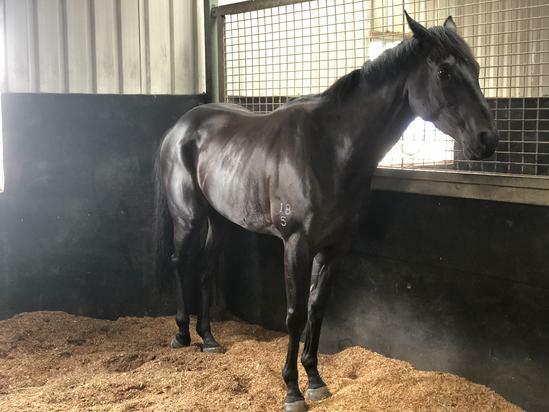 Kwinana (f. by Lonhro). Winner at 900m, 4th ATC Gimcrack S., L.
MANICURE (Exceed and Excel). 3 wins-2 at 2-at 1100m, 1200m, A$464,275, to 2018-19, BRC Nudgee S., L, ATC TAB Rewards 2YO H., Casino Prince at Vinery 2YO P., 2d ATC PJ Bell S., Gr.3, Triscay S., Gr.3, GCTC Magic Millions Fillies & Mares P., 3d ATC Guy Walter S., Gr.2, James HB Carr S., Gr.3, 4th ATC Darby Munro S., L.
O'Tauto (O'Lonhro). 2 wins-1 at 2-at 1200m, 1400m, A$188,000, to 2018-19, VRC Furlong Bar H., 2d VRC A Bartlett H., Christmas Raceday Trophy H., 3d VRC CS Hayes S., Gr.3. GATTING (Hard Spun). 9 wins from 1100m to 2400m, A$1,300,700, to 2018-19, Western Australian Derby, Gr.2, WATC Lee Steere S., Gr.2, Ascot Gold Cup, L, Melvista S., L, Swan River Vase P., Peacock Bros P., Tabtouch Masters H., Seacorp H., 2d Perth Racing Railway S., Gr.1, Ted Van Heemst S., Gr.2, WATC JC Roberts S., L, Belmont Guineas, L, Pinjarra RC Chemmart Pharmacy P., 3d WATC Strickland S., Gr.3, Belmont Classic, L, 4th Perth Racing Kingston Town Classic, Gr.1, WATC Belmont Sprint, Gr.3, Roma Cup, Gr.3, Hyperion S., Gr.3, Aquanita S., L.
Standfast - Cincinnati V (Mal.). 3 wins at 1000m, 1200m in Aust. and Malaysia, SAJC Galway Bay H.
Unswerving. 2 wins. See above. Akimbo. Winner at 2, STC Millennium Foundation 2YO H.
FAITHFUL LOVE (Deputy Governor). 3 wins-1 at 2-to 1200m, A$115,230, VRC Red Roses S., L, SAJC Cinderella S., L, VATC Auspower H., 2d VATC Out of Danger 2YO H., 3d VATC Whisked H. Producer. Stylish Mahal (Stylish Century). Winner at 1600m, WATC Sandringham Hotel H., 2d WATC Budget H., 3d WATC Derby, Gr.1, WATC Bianco Lady Quality H.
DESUETUDE (Strategic). 3 wins-1 at 2-to 1300m, A$314,300, 38,096Dhs, STC Run to the Rose H., Gr.3, 2d STC Canterbury Classic, L, 3d AJC Royal Sovereign S., Gr.2, STC Golden Rose S., Gr.2, Hobartville S., Gr.2, Gold Coast Guineas, Gr.3. Race Record: 6 Starts 1-1-0 A$24,790. Winner at 1700m in 2018-19 in Aust.